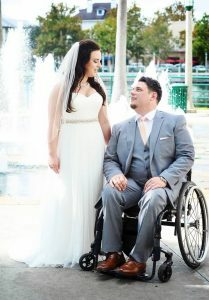 A Celebration Elopement was just what Courtney and Anthony ordered from Intimate Weddings of Orlando. With hectic lives with her as an intensive care nurse and he a state prosecuting attorney, between their jobs and purchasing a home, they just couldn’t find the time to plan a big wedding. After looking for at options for weeks and weeks, they decided to travel to Orlando for some rest and relaxation and maybe…get hitched. All they needed was a beautiful location, an officiant, marriage license, and a photographer. Victoria with Intimate Weddings of Orlando worked with them to find the perfect location to fit the two of them for their elopement package. Anthony had limited mobility after a motorcycle accident ten years ago, so something that would allow him access without having to go off road. The Celebration lakefront, with it’s water views, fountains, and nature trails was the just the right fit. Christopher Smith with Snap Photography did a fantastic job photographing the couple all over the lakefront and town streets of Celebration. Kimberly Smith provided hair and makeup for Courtney before she arrived to marry her prince charming. Rev.Glynn Ferguson with Sensational Ceremonies worked with Anthony and Courtney to create a beautiful and simple ceremony that fit the two of them. Congratulations !!! We wish you happiness for a lifetime.